The Book Rat: Viewer's Choice: Vote on what you'd like to see during AIA! Austen in August is going on RIGHT MEOW, so let me know which video you'd most like to see sometime in the next 2 weeks! 1. Review of an Austenesque book from my shelves (I'll let you guys pick if we get to that stage)! 2. A series of "first impressions" videos of 3 or 4 Austenesque books from my shelves! 3. A "tour" of all of the Jane Austen bits and bobs I've collected over the years! 4. 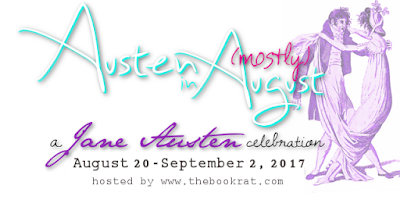 An Austen-inspired book tag! 5. A step-by-step tutorial of Austen-inspired watercolor or word art! I'll leave the voting open for about a week or so, and then record the winning video & post it for Austen in August! Tell me YOUR choice in the comments and/or via the poll in the video! Just one??? Oh dear, tough pick. I'll go with a first impressions for my vote. I think I will choose 3: a tour of your JA bits. First Impressions is my choice! Great choices! I love your Jane Austen videos! I like the first impressions too. What is the book tag option? First impressions! But I'd like to know more about the book tag option, too.